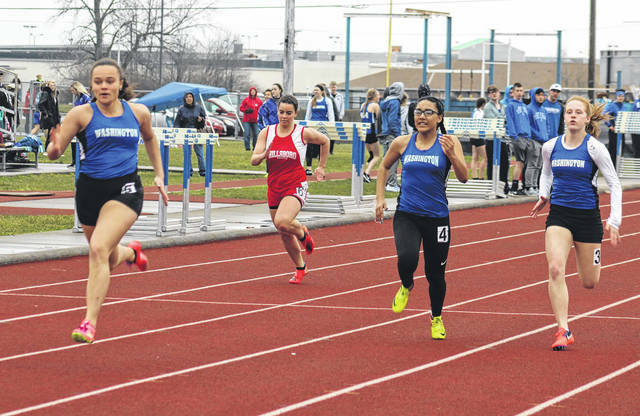 The Washington Lady Blue Lions swept the first three spots in the 100-meter dash at the season’s first track meet Tuesday, March 27, 2018 at Washington High School. Pictured (l-r); Jaelyn Mason, 1st; Tahja Pettiford, 3rd and Tabby Woods, 2nd. Caleb Rice clears a hurdle on his way to winning the 110-meter event for the Blue Lions at Washington High School Tuesday, March 27, 2018. 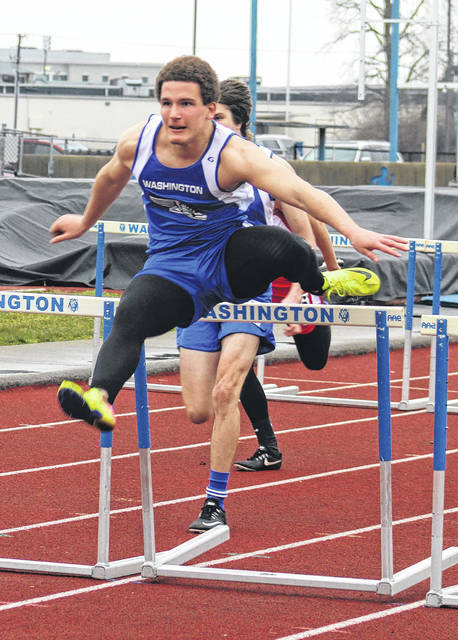 The Washington Blue Lions opened the 2018 outdoor track and field season with a dual meet against Frontier Athletic Conference opponent Hillsboro Tuesday, March 27. The Lady Lions won the girl’s meet with 68 points to 56 for Hillsboro. The Indians won the boy’s meet, scoring 97 points to 30 for the Blue Lions. Washington’s girls won eight events. Savanna Davis won the high jump at 4’ 6”. Davis also won the long jump with a leap of 13’ 11”. Hannah Patterson won the 100-meter hurdles in 20.60. Patterson also won the 300-meter hurdles in 1:13.18. Jaelyn Mason won two events for Washington. She captured the 100-meter dash in 14.22 and the 200-meter dash in 30.13. Maddy Garrison won the 3200-meter run in 12:05.0. Cloe Copas won the 1600-meter run with a time of 6:06.05. The Blue Lions took first place in four events. The team of Brandon Underwood, Cody Riley, Chris Conger and Kameron Morris won the 4 x 800-meter relay in a time of 9:29.32. Morris also won the 1600-meter run in 5:10.0. Caleb Rice won the 110-meter hurdles in 16.99. Trent Langley won the 300-meter hurdles with a time of 47.36. Washington’s next meet is Saturday at the Rocky Boots Invitational at Nelsonville-York at 10 a.m. Shot put: Bethany Wilt, 3rd, 26’ 7”; Abby Garrison, 6th, 23’ 2”.